Clear Automation is a leading robotic systems integrator specializing in flexible industrial automation techniques. Clear Automation’s key strengths include Industrial Robotics, Automation Design, Machine Vision, PLC’s, Line Tracking, and custom PC Applications which are deployed to assemble, inspect, label, laser mark, dispense, and package products. Industries served include Cosmetics, Personal Care Products, Medical Devices, Pharmaceuticals, Automotive, Aviation, Food and Beverage, Consumer Packaged Goods, Consumer and Industrial Electronics, and Industrial Processes. This automated cell was built to put caps on bottles. It features a small SCARA robot, Herma labeler, vision inspection, tray elevator for bottle caps, reject station and touch screen HMI. This Carton Box Labeler was designed by Clear Automation to meet the demand for a highly flexible labeling system that allows the user to place up to three labels on a single flat carton in infinite configurations. This machine uses a Fanuc LR Mate robot and two Herma labeling heads. Boxes are picked from an in-feed conveyor, reoriented and placed on an indexing conveyor. This feeder utilizes a vision-guided Fanuc M2 robot to pick parts from two FlexiBowls and place them into trays at 95 ppm. This custom labeler uses three HERMA labeling heads and tamp-pad technology to accurately place a label on each of three sides of boxes at a rate of 10 ppm. 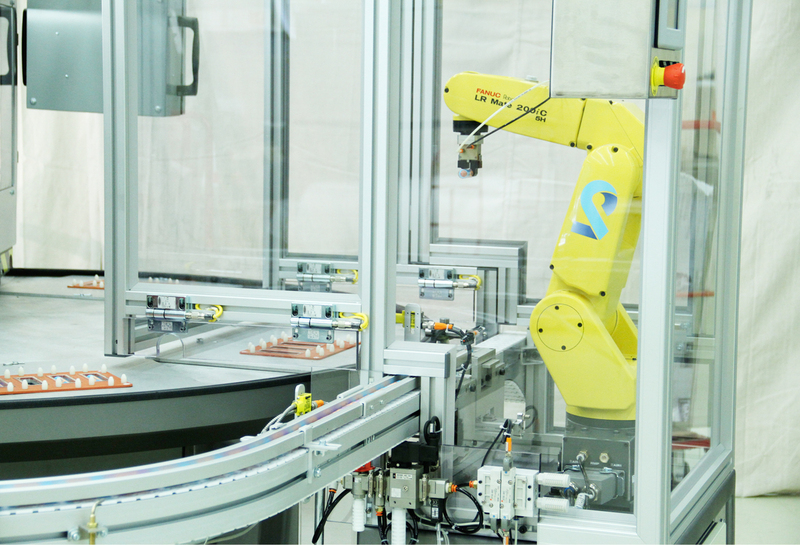 This robotic labeling system uses two Herma labelers to apply a label to two bundled stacks of product and to the bottom of each stack simultaneously.